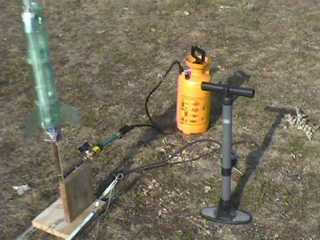 The pipe which is used for the filling, the pressurization of the rocket and the guidance during the first time of the launch. The originality of this launcher lies in the double pipe, which allow the filling of water and the inflation on the launcher. 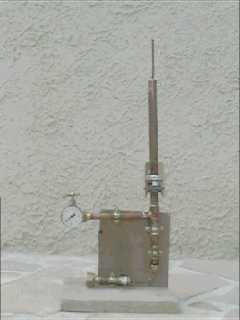 The yellow pipe is in copper with a 20 mm diameter. It allows the filling of water. The blue pipe, in copper also but a diameter of 6 mm, allows the inflation and the air exhaust off the bottle during the filling of the water. And this is the first implementation. 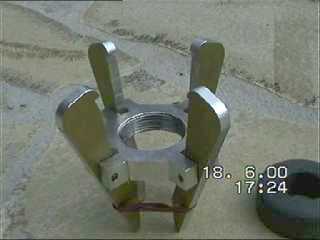 The trigger mechanism of this first implementation, had nothing extraordinnary, this is just 2 lugs which rotate. There is a second implementation, sparer, but with a trigger mechanism more sophisticated. Waist shot on the trigger mechanism. 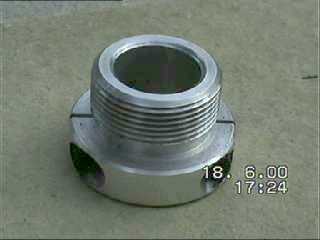 It is composed of a base, which is a kind of cross with a hole threaded in its center. On each arm of the cross a cam is connected to. The upper of the cam hooked the flange of the bottle. 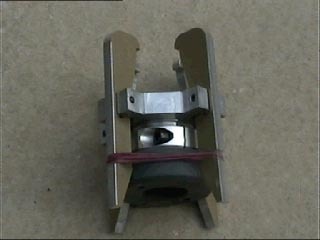 On the bottom, a rubber band tries to kept the cams opened, but a sleeve in PVC (in grey on the picture), which can slide along the copper pipe, keeps it closed. If we pull down the sleeve, the cams open and thus release the rocket. The cross is screwed on the "screw" (on the left), which is gripped on the copper pipe by the use of two screws which narrow the lips bellow the threaded part. On the opposite, a picture of the "jaw". We can see the thread in the center and in the lower right corner, the sleeve. 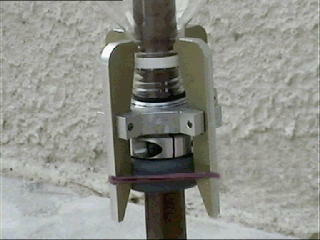 Other view of the system which offers a better view of the fastening of the system on the pipe. 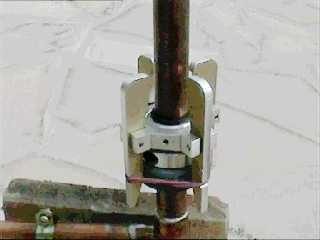 The splitted screw is gripped on the pipe with the help of two screw. We can see one of its on the center of the picture. The entire system on the pipe and with a bottle. There is a complete view of the launch pad. On the left, the launcher with a rocket in place (Here is my "Double Valse", a double 1,25 litre), on the right is the pump and in yellow, there is a sprayer turn into a "filling device" (an idea of Hervé Brégent). The sprayers work like water rockets, the tank is fill in water and then we put pressure by pumping (the black handle on the top). The water being under pressure, we can fill in the rocket while the pressure inside the rocket is less than those in the tank. When we fill in the bottle, the pressure inside increases and those in the sprayer decreases. In practice I fill in about 2 liters without having to pump again, but I don't have made any study on the subject. This system makes useless the little pipe inside the main pipe of my launcher. Because its goal was to evacuate the pressure inside the bottle while filling in water. So a new launcher simpler is planed.